The Budget Pull Up Banner keeps things simple it matches the other banners on the market in terms of ease and effectiveness of use, but beats them on price. Features are kept to a functional minimum and construction is simplified as much as possible without impacting on performance. All this enables Slimline Warehouse to give you the best price possible. Pull ups are often used at trade shows, exhibitions and for temporary marketing, but they’re also great for retail! Combined with a quality graphic they have real impact as a versatile element of a shop window display or can be used in store with the same effect as a huge poster display with the added bonus that they are freestanding and easily moved to exactly where you need them. Slimline Warehouse’s budget pop ups have an unobtrusive and modern design that boasts a huge advertising area that’s difficult to achieve with regular poster holders and come at a very competitive price. All eyes will be on your graphics – that’s what makes them so effective in crowded retail or exhibition environments. 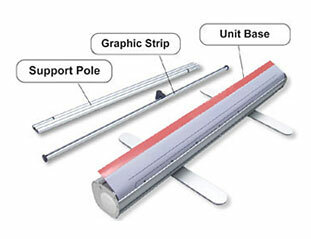 We offer a large range of retractable banners which are supplied in small and large banner sizes. 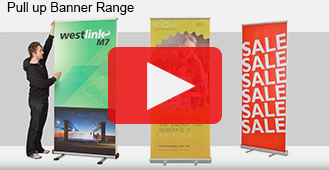 The range extends to our premium pullup banner range such as our Broad Base, Premium or Blue Chip models. These models have features like telescopic poles, concealed pole compartments and are offered in a large variety of colour and style choices. 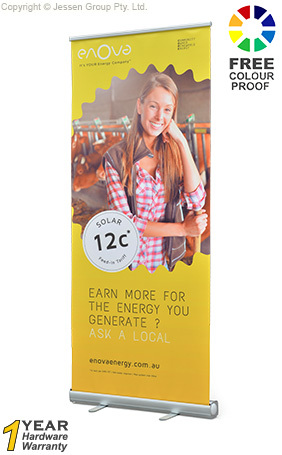 These banners are perfect for use in events, tradeshows, or for retail promotion or exhibition venue banners. Our pop up banner stands are shipped with all the necessary components: base, support pole, graphics and carrying bag so you and your ready to go pull up banner can make an impact.